↑ "AFI's 100 Years ... 100 Stars". American Film Institute (Afi.com). June 16, 1999. Retrieved June 22, 2013. ↑ "1980 James Stewart Tribute". AFI Life Achievement Award. American Film Institute. Archived from the original on June 17, 2010. ↑ Smith, Lynn (March 30, 2003). "In Supporting Roles". Los Angeles Times. p. 193. ↑ Eliot 2006, pp. 164–68. ↑ Fonda and Teichmann 1981, pp. 107–08. ↑ Fonda and Teichmann 1981, p. 97. ↑ Eliot 2006, p. 239. ↑ "Gloria Stewart obituary". The New York Times, February 18, 1994. ↑ "1LT Ronald Walsh McLean". VirtualWall.org. Retrieved June 27, 2013. ↑ "Kelly Stewart". anthro.ucdavis.edu. Retrieved March 7, 2012. Archived May 17, 2011, at the Wayback Machine. ↑ Lawson, Terry C. Erroneous Eagle Scouts Letter. Eagle Scout Service, National Eagle Scout Association, Boy Scouts of America (2005). Retrieved June 9, 2005. ↑ "James M. Stewart Good Citizenship Award" Archived 2008-06-24 at the Wayback Machine., jimmy.org. Retrieved March 7, 2012. ↑ "It's a Wonderful Life for a fellow member!!" srcalifornia.com, Fall 1995. Retrieved August 2, 2012. ↑ McMahon, Ed. "Ed McMahon says farewell to Johnny Carson". MSNBC, September 12, 2006, p. 3. 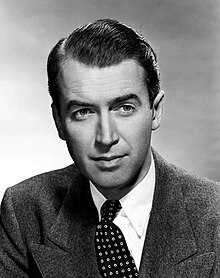 ↑ Nichols, Mary E. "James Stewart: The Star of It’s a Wonderful Life and The Philadelphia Story in Beverly Hills". Architectural Digest. Retrieved September 22, 2013. 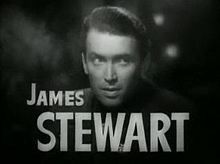 ↑ "James Stewart – Classic Cinema Gold". 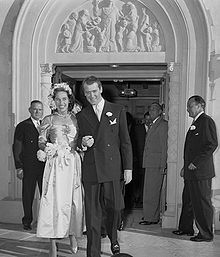 ↑ "James Stewart Biography". The Biography Channel. Retrieved September 22, 2013. ↑ Ellenberger, Allan R. (2001). Celebrities in Los Angeles Cemeteries: A Directory. Jefferson, NC: McFarland & Company. p. 72. ISBN 978-0-7864-0983-9.